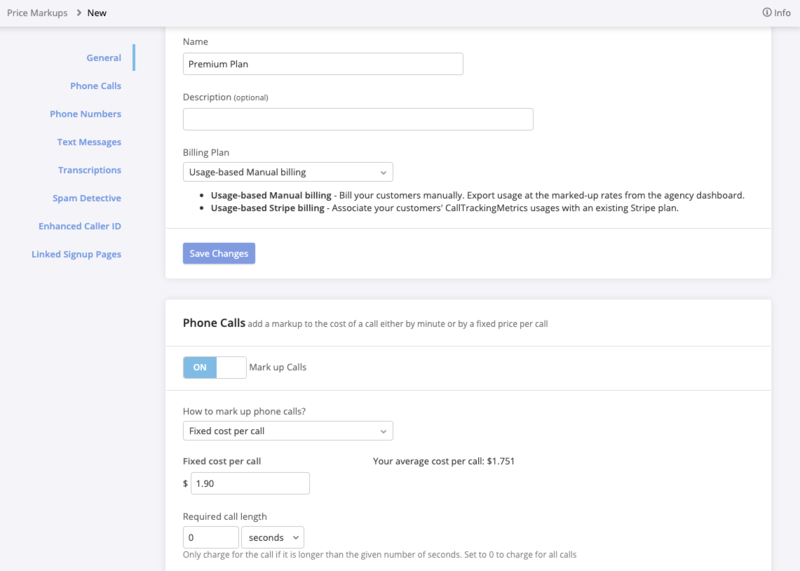 Setting up price markups for your subaccounts will allow you to charge your customers at a marked up rate for phone calls, phone numbers, text messages, transcriptions, Spam Detective, and premium caller ID lookups. Each of the markup options can be enabled or disabled independently. When your customer purchases a tracking number, they will see the prices you have set in the price markup. The marked up prices will also see these prices reflected in the account usage report. When you choose to either export your agency billing file, you will see the usage at both your marked up prices and the prices your agency is paying CTM so you can bill your clients accordingly. Navigate to Settings → Price Markups. If the agency does not already have any price markups, you will begin creating a new one. Otherwise, click New Price Markup in the upper right. Enter a name for the markup so you can easily differentiate it from other markups in your account. Usage-based Manual billing: select this if you wish to bill your customers manually. You will need to export usage at the marked-up rates from the agency dashboard to generate a bill for your customer. Usage-based Stripe billing: select this if you wish to associate your customer’s CallTrackingMetrics usage with a Stripe plan. Click here to learn more about the CTM integration with Stripe. If you have created a signup page you will use to have your customers create their own CTM accounts, you can assign a price markup to a signup page to have the markup automatically applied to the customer’s new account. On the Price Markup settings page, click or scroll to Linked Signup Pages. Click in the empty field to select from the list of available signup pages in your account. You may select multiple signup pages.